98/104 size is currently out of stock. 158/164 size is currently out of stock. 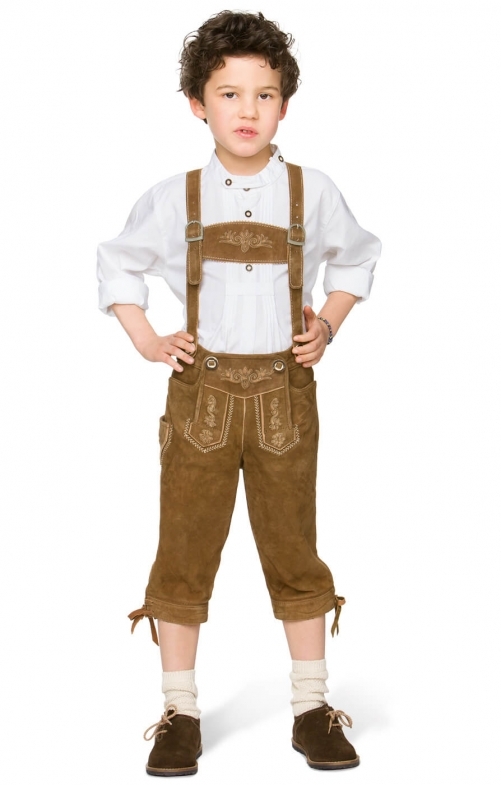 Children's Knee-Length Lederhosen P-300 in Light Brown. Made from 100% leather, these tan-coloured children's knee-length lederhosen are supremely comfortable to wear and look great with either a traditional checked shirt or a stylish T-shirt worn underneath. The intricate embroidery on the H-beam suspenders perfectly matches the design featured on all three pockets, the front, the rear and down each leg. The leather tie at the back means that they will fit perfectly, no matter how small the waistline of the child. The large deerhorn buttons are a nice finishing touch that compliments the overall look of this item.